High Plains Public Radio’s Living Room Concert Series provides an open forum for live music on the High Plains, enriching our community connections and cultural awareness. 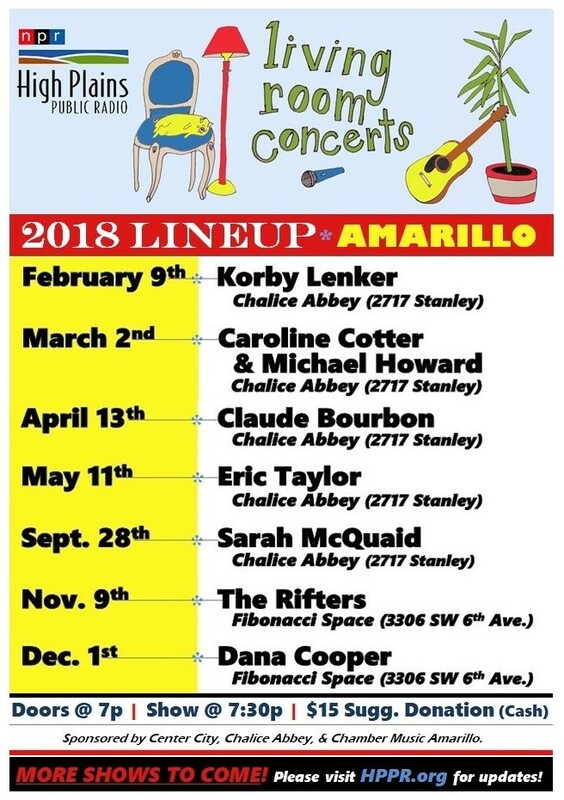 Primarily hosted in Amarillo, TX and Garden City, KS, these shows support musicians from our region, as well as those passing through the Plains. February 9, Korby Lenker at Chalice Abbey, March 2 Caroline Cotter & Michael Howard at Chalice Abbey, April 13 Claude Bourbon at Chalice Abbey, May 11 Eric Taylor at Chalice Abbey, September 28 Sarah McQuaid at Chalice Abbey, November 9 The Rifters at Fibonacci Space, and December 1 Dana Cooper at Fibonacci Space.